Summary: Ronja is the daughter of the chief of a tribe of bandits. She lives in a huge castle in the forest with her family…and the bandits. Ronja’s tribe is not the only group of robbers in the forest, there is another, and the two do not get along. They always seem to be getting into it about their potential robbery victims. Ronja always seems to be getting herself into trouble, whether she is encountering mystical creatures, making friends with people she should not, or causing grief and problems for her father. Despite all the ruckus, Ronja’s father loves her and the whole tribe adores her. The first thing you will probably notice about Ronja the Robber’s Daughter is the animation style. It may take some getting used to, but that is just because it is so unique. Once you fall for the characters and become enveloped in the story line, you will forget the unique animation. While there are hints of an episodic series with Ronja, there is also an overall story that continues to progress as the season does. Overall the story focuses on Ronja’s adventures in the forest and growing up as the daughter of a robber. It is worth noting that the series is directed by Goro Miyazaki, and is co-produced by Studio Ghibli. Miyazaki stated, “Ronia the Robber’s Daughter is a story not just about a girl who grows into adulthood, but it is also a story about the love and growth between a parent and a child, and a story about the bonds between friends. My goal is to create a work that everyone, from children to adults, will be able to enjoy”. You might enjoy this if: You are interested in discovering a new fantasy world and a sweet coming-of-age story. You might not like it if: You insist on traditional animation style in your anime and would be bothered by something so different. 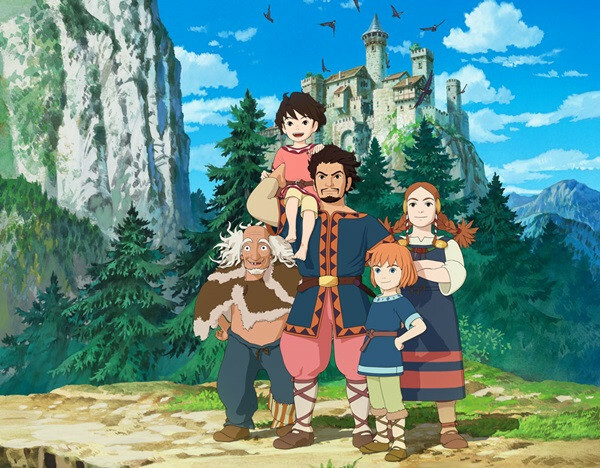 Note to the Viewer: The anime is based on Ronia the Robber’s Daughter, a 1981 children’s fantasy book by Swedish author Astrid Lindgren. This entry was posted in Anime and tagged 2014, adventure, anime, breanne, daughter, evans, fall, fantasy, fragglepuss, ghibli, goro, miyazaki, review, robber, ronia, ronja, studio. Bookmark the permalink.